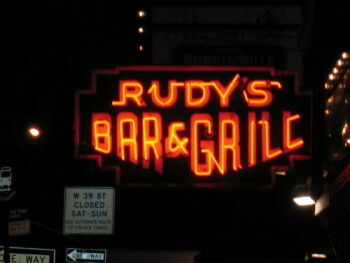 Rudy's Roots. Who is Rudy, and what does he believe in? Much detail in�Newsweek. A Chavez Freezing Fenzy. Gateway. The insanity epidemic. Moonbattery. Paranoia, stupidity, or plain boredom with life? Insty found this brewing story about the Clintons and Vin Gupta. At one point will a Clinton candidacy prompt the following question of Laura Bush �Do you feel qualified to run for President, after eight years as First Lady�? What would be the reaction if she said �being First Lady doesn�t qualify you to be President�? when i saw ''Freezing Fenzy'' i thought you meant ''Freeding Frenzy'' but then i realized speling is different in Rudy's Bar & Grilc. Fur is green...right up there with carbon credits. I've always thought fur was more environmentally sound choice over synthetics, it just makes sense. This is where the animal right people and real environmentlalists conflict.Like the people saying wool is cruel because some times sheep get hurt. I tried to tell an anti hunting friend who was touting Al Gore, that shooting a deer and eating it is better than raising beef on grain as far as the environmental impact is concerned but she didn't get it. Nice leaves picture today BD. Might be a good day to get out the rake. I'll be shoveling some because a few inches of snow fell last night. Rudys B&G looks like a nice place to come in from the cold too. Chez Rudys. In a salute to global worming here is link to Kate at sda and a funny statement from poor, pathetic Elizabeth May, head of the nutbar Green Party. The Greens have always lacked any real voter support and have no seats in Parliament. Luckily, however the press has annointed the Greens as an "official" Opposition Party. In Canadas 'first past the post' parliamentary system, more vote splitting between the left wing parties equals more seats for PM Harpers Conservatives. I think the left will remain in some disarray and expect Harper will be PM for several more years. Parliamentary politics can be full of twists and turns but the PM is in the 'catbird seat'. Which words in the following phrase are incorrect? There aren't many things about growing older that one could actually put in the "Good" column, but one of them is certainly the perspective that time gives you. I remember reading a similar poll when I was in college, so that would make it about 35 years ago, and I've been reading these things ever since. 45% think America was discovered by George Washington. 55% think we won our independence from Britain in World War I. 32% believe the moon landing was faked. 47% believe the CIA was behind JFK's assassination. 85% think Hanoi Jane would make a great president. Same stuff as today. Nothing's changed. It's not "the", it's just "more of the same". It's not "insanity", unless you're prepared to lock up 98% of the populace. And it's certainly not an "epidemic". How about "business as usual"?